Sitka Senator Bert Stedman may be looking at one of the most difficult legislative sessions of his career. A financial manager by trade, Stedman openly opposed the previous governor’s modifications to Alaska’s oil tax structure. He anticipated a day of reckoning and — thanks largely to steep declines in the oil market — that day has come sooner than anyone expected. State senator Bert Stedman represents Sitka, Petersburg, Wrangell, Ketchikan, and most of southern Southeast Alaska. The 29th session of the Alaska Legislature gavels in on Tuesday, January 20th. Read Gov. Bill Walker’s recent op-ed piece about oil prices here. Raven Radio will broadcast Gov. Walker’s State of the State speech Wednesday evening (1-21-15) at 7 PM. His State of the Budget speech will air on Thursday evening (1-22-15) — also at 7 PM. Stedman says there’s still plenty of work to do, besides wrestling with the state’s finances. Alaska is facing a scenario that anyone of us might encounter if we lost our job. We’ve got enough savings to ride out a rough patch — for a while. But the problem is a bit more complicated than just paying our bills. In a recent opinion piece, Gov. Bill Walker reported that the state expects to pay out in tax credits to oil companies about $100-million more than it takes in. That’s right — Alaska is still producing a large amount of oil but thanks to a perfect storm of large production incentives and falling prices — we’re looking at paying oil companies to haul the stuff away. If world oil prices remain low, that bill could rise to $400-million next year. The governor calls it “irresponsible” to be paying for our own oil, but producers are already urging him not to change the tax structure. Alaska’s oil revenue scheme tends to change with administrations — which Stedman considers a liability. When he was appointed 12 years ago by then-Governor Frank Murkowski, the state was trying to raise revenues. Stedman says the oil tax system at the time — known as the Economic Limit Factor, or ELF — was outdated. Stedman made headlines last year when he defied fellow Republican Gov. Sean Parnell and signed the citizen initiative petition that put Senate Bill 21 on the statewide ballot. He also didn’t play nice with Parnell’s predecessor, Sarah Palin. Although Stedman held a powerful chairmanship in that era — of the Senate Finance Committee — the governor vetoed his projects liberally. Stedman has a less influential role in Alaska’s new, more right-wing senate. But he’s optimistic about Gov. Walker. Gov. Walker has already pulled back state funding for capital projects that don’t have a significant federal match. That puts at least a couple of big roads in the district — Katlian Bay in Sitka, and the Kake-Petersburg Road — at risk. Stedman says there can be no sacred cows this session. And there is an upside for Southeast as it weathers state budget reductions, according to Stedman. Both commercial fishing and tourism will benefit from low oil prices. 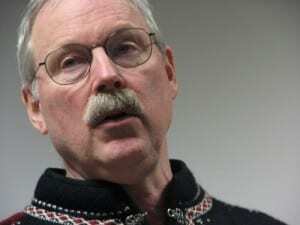 Nevertheless, as he heads to Juneau, Stedman wants Alaskans to understand the scope of the problem: Oil prices are not expected to go up again soon. It’s likely that producers will scale back operations on the North Slope regardless of tax credits. And Stedman is preparing for a long haul.